July 1 - 3rd, 2011. I'd like to thank Jacque Andre for putting on such a great event and Arno for all of his help. The tremendous support and encouragement from the other builders and the enthusiasm of the public towards the guitars is very much appreciated. 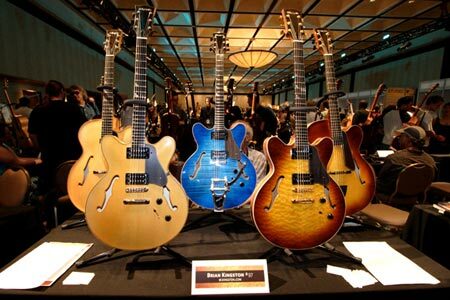 "Brian Kingston chose to present the more electric end of his offerings at the show, including these three semi-hollow beauties, all of which sounded wonderful and played like the proverbial butter". Harmony Central has a review of the Fusion, posted Feb 2011, by recent client Kevin from Dallas, Texas. I call everybody who purchases my guitars when they send in their warranty cards and answer any questions; and ask a few questions. I won’t try to quote them but will provide a quotation from a note included with the card returned by new customer Alain Rohan of St. Paul, MN. “Please find my owner registration enclosed with this letter. I have just purchased one of your archtops from Gruhn Guitars in Nashville. I bought the guitar based purely on the description (of its sound) by Mr. Andrew Smith at the store, and on the photos available at the Gruhn Guitar website. I like the guitar a great deal and intend to keep it. It has fine sound and the slim neck fits my fairly small hands. The wood seems to have been carved very delicately, something which I always consider masterful and which often imparts the best sound to such archtop guitars. "I am the owner of Guitar # 130003 purchased @ Gruhns April of 05 and am very pleased with the guitar it not only looks great but feels right and has a wonderful sound I have played it on many gigs since its purchase and get comments from listeners about its looks and sound. I am very pleased that you have a website now and are going to be @ the Montreal guitar show. (unfortunately, I cannot attend the show) I would like to discuss with you about building me another guitar w / a mounted pickup?" “My Kingston guitar beautifully combines exquisite craftsmanship with gorgeous tone and playability. Love it!" “I've played Brian's thinlines and I love them. They sound great and are fun to play. There aren't too many folks out there willing to put in the time to make these guitars sing." "...In Nov.'07 I bought from Fine Guitar Consultants(Richard Glick) in San Diego a BCKingston Fusion. It is blue and mahogany. I saw it, played it and loved it. I am really happy with this wonderful guitar and want to thank you for your wonderful work. I play a lot of Jazz and Smooth Jazz. Your guitar is the perfect instrument for me. I used to take three different guitars on a gig, but now, I only play the Kingston Fusion and it works for everything."